- Local podcast typically highlight the ... See More good things happening in your local city area, create connections with people in your community, and make the place where you live– a better place to live. - If you’re a podcaster and don’t have a local show, I hope you’ll make one and bring your knowledge and skills that can bring people together and make a positive difference in your community. - Get started thinking about telling the stories of your community. - Local podcasters talk with neighbors, friends, business owners, civic leaders and share those stories with the community. - They are building up their community through podcasting, but some of those communities are very small. - Local podcasters are applying their knowledge, skills, and curiosity to gather stories from their community and tell those stories to their community and beyond. - Local podcasters are making a contribution to their community—perhaps changing their community as a result of their work. - Some of those podcasts will never make money and for many that will be ok.
- Most will never be considered “noteworthy” by others who have a narrow view of podcasting. - The revenue/profit earned by local podcasters may be more valuable than that achieved by national shows. - Like current radio advertising, it would come mostly from local companies, but national advertisers still need to reach local communities too. Podcasting doesn’t end when you hit “Publish.” Your content needs to get to your listeners’ ears, and effective distribution means sharing your content quickly and looking good while you do it. But when you’re podcasting to-do list is already inundated with different tasks: mixing, editing, uploading, describing, tagging – some of the process risks falling by the wayside. That’s why we’ve been focusing so much on the new CMS, to offer you a dashboard full of quality tools and features to help you every step of the way. And today, we’re eager to show you the newest process to auto-share episodes to all your social networks. - Distribution isn’t just about garnering plays and downloads, it’s also about interacting with your listeners and building a relationship, because in the end you’re sharing your podcast with people. Find out where those listeners are - connected to the social networks they’re active in. Just the idea of sharing your episodes’ links to each manually, one by one, sounds overwhelming. But with the CMS, you can cover lots of ground quickly with a simplified distribution process: connect to multiple social networks and enable auto-sharing. While auto-share is a huge convenience, you might still want to manually post to these social networks as auto-share does not always get treated with the same priority as far as visibility. Facebook does not treat auto posts the same way as manual posts - usually less priority is given to friend visibility. - The importance of appealing podcast artwork keeps coming up again and again, but not without good reason. Getting listeners to tune in is as much about attracting them with great visuals as it is a catchy title, plus you want to keep your brand present in people’s minds, no matter where your episodes get shared to. So how can you make sure that things look right when everything is getting shared automatically for you? The CMS takes care of that, too. You’ve always been able to add dedicated images to each episode you create, but if you forget to or choose not to, your cover image will now automatically get used in its place. So no matter where your listeners find it, your podcast looks its best, and stays aligned with your brand. 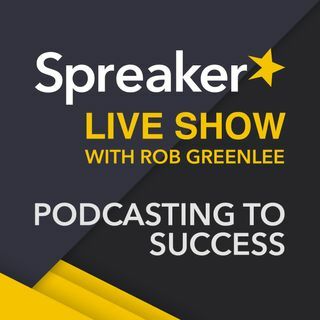 Spreaker Live Show: Live is interesting as a way to connect with listeners at a deeper level. Agree, to each his own on this Live vs On Demand choice. Thank you for listening today to our Local Community Podcasting topic this week.